Save your sanity, time & money! Need solutions for the medication, medical appliances and/or medical travel that you can't afford? READ EMPOWER Yourself. A Health Information Management professional, I survived a life-threatening emergency with information that only a person of my professional experience would know. And I’m sharing it! This blog has been attacked by SPAM so intensely that I had to seek a new way to share information with you. Blogspot did not end the problem despite weeks and weeks of my pleas for help. for further updates about cutting-edge medical care and other information that you need to know. Face your medical problems with dignity. Face your future with optimism. Here's How to Request Co-Pay Assistance for the Treatment of Brain Tumors in the Past Three (3) Months! Copay assistance program is now open! Thanks to generous donations, we are able to reopen our copay assistance program! We have a lookback period of 3 months from when the completed application arrives so if you are approved, and have paid for a covered treatment in the last 3 months we can reimburse you! People who prefer organic food tend to eat lots of fiber, and that's a good thing, too. Find out why when you click on The lifesaving food 90% aren’t eating enough of! The next time that you and your family wake up to a chilly morning, bake sweet potatoes with the skins on for a hot, high-fiber breakfast that's very satisfying. Little ones will think that they're eating dessert for breakfast! If you need to convince finicky eaters to eat sweet potatoes in the skins, remove the pulp and whip it with beaters. Serve the results in a cereal bowl (they're easier to chew and to swallow) and show the child that you're eating the skin bit by bit with a big grin on your face. Temptation can be a powerful motivator. If that doesn't convince a tough customer to eat the skin, drop the subject and be happy that the little ones ate a hot, hearty bowl of sweet potatoes packed with nutrition all of their own. ENJOY THAT VITAMIN A BOOST. It's a simple way to way improve your overall health. How to live longer: Eat sweet potato daily to slash cancer and high blood pressure. Want to cope with medical and/or mental health problems, including the expenses for your care? Click the link to buy the E-book or print edition of EMPOWER Yourself to Cope with a Medical Challenge. Face Your Medical Problems with Dignity. Face Your Future with Optimism. Fill your body and mind with relief. There's plenty of good news in the medical world, and some of it is because increasing numbers of doctors admit that their recommended diets don't work. Studies are being reconsidered, redesigned, and reclassified so that medical professionals can help people to lose weight easily and sensibly. Increasing attention is being paid to those of us who do not struggle with weight control, and why. Those updated healthcare professionals can help people to prevent becoming overweight in the first place. Food is a significant part of the problem - the WRONG food, that is. It can affect fertility, weight, energy levels, health, mood, and more. I know one naturopath invited to many baby namings because she advises infertility clients to stop ingesting dairy foods. They're full of Mama Animal's hormones, designed to fatten up her children. They create havoc with human hormones. Add in the synthetic hormones from hygiene products that I've warned you about at this blog, and infertility plus obesity easily become "OMIGAWD why am I fat and/or infertile?" issues. People complain that they can't keep their weight down as they swallow more lo-cal ice cream, lo-fat cottage and reduced-calories sliced cheese, etc. THEY EAT THEIR OWN PROBLEM, GUARANTEEING THAT IT WILL CONTINUE UNTIL THEY STOP SWALLOWING DAIRY "FOODS" DESIGNED FOR ANIMALS, NOT FOR HUMANS. to make your body fat. It's also important to support thyroid health when your energy levels fall and your weight rises. Add iodine-rich seaweed to your menus. Sushi is made with nori leaves. Enjoy your weight-management meal. Kombu is a seaweed sold in flakes and as leaves. Add them to your lentil dishes. Arame, wakame and other sea leaves make lovely additions to a meal. I decorate steaming hot sweet potato with strands of arame, The pretty orange-green color combination is eye candy. The flavor of the dish is mouth candy that's nutritious for inner and outer health. There's far more to the natural weight-control life. I only offered a glimpse into it with the thoughts above. Okay, on to the next topic for today: WHEN DOCTORS BLAME THEIR PATIENTS FOR PROBLEMS THAT THEY DIDN'T CAUSE! The problem is close to my heart: a good friend was diagnosed with Smoker's Lung. She's never touched a cigarette in her life and neither has her husband. Air and other pollution gave her the disease. book holds passages about how best to respond to irate, irascible, and otherwise rude doctors, technicians and nurses. Read it to prepare yourself for an appropriate self defense. There are ways to solve the problem. Fill your thoughts with good sense. Dr Musella's organization (the Musella Brain Tumor Research Foundation) is superb and his own upbeat remark is among the back-cover praises for the EMPOWER Yourself to Cope with a Medical Challenge book. Check out the Just Announced good news for people who need financial help with brain tumor treatment! Our copayment assistance program is probably going to reopen soon! Tiffani Rockwell Fomera What program is that? Melanie Metcalf Lovell Tiffani, it helps people to purchase medicine when they might not otherwise be able to due to high insurance co-pays/deductibles. This is the program I have always contributed to, because as necessary as animal testing may be, as a vegan I am not comfortable funding testing on animals. This is a win-win....I can contribute to this program and help those fighting GBMs without funding animal research. Al Musella Braintumorcopays.org we help malignant brain tumor patients pay for Optune, Temodar, Gliadel and Avastin! Al Musella As to animal research, for those of you who do not want to fund animal research, you can tell us to only use the donation for human research. We gave a $1 million grant which will only be used to treat pediatric brain tumors - the grant is 4 payments of $250,000 over 3 years. We are saving up for the next payment. You can always donate to that! Want to cope with medical and/or mental health problems, including the expenses for your care? Buy the E-book or print edition of EMPOWER Yourself to Cope with a Medical Challenge. Fill your life with solutions! Among the things that I've learned during my Health Information Management career are memory improvement skills. I learned other memory boosters in rehabilitation efforts following my brain surgery. The following article is only an overview of the possibilities for improving your memory. Buy the E-book or print edition of EMPOWER Yourself to Cope with a Medical Challenge. Fill your memory with happiness. I was with some friends last evening and one of them suddenly looked rather ill. A doctor, he was feeling weak, dizzy, and a bit nauseated. He seemed to be struggling to breathe. ​I asked permission to feel his face and neck to check for clammy skin. It was dry and warm to the touch. I asked if his left arm felt painful.​ ​He was slow to respond "No, my stomach bothers me." My concern grew. He was showing signs of a pending heart attack or one in progress. ​I told him that he needs to be examined by an emergency room doctor. S​hort story: he's okay, just overtired from too much stress and excessive work hours. It was not a heart attack. Folks, I was following the instructions that I'd learned in a CPR (Cardiopulmonary resuscitation) course. It is important to know how to respond calmly and capably in a time of suspected medical emergency. PLEASE seek out such a class for yourselves. You might end up saving a life or two. P​S - The doctor called to thank me for checking him. He knew exactly what I'd suspected the whole time and appreciated that someone could have saved his life on the spot if necessary. Fill your skillset with life-saving facts. Practice what you learn. I read a headline and knew that I have to share it with you. Please click on High prices make U.S. the biggest health care spender among Developed Countries! Inspirational plus Can-Do, Do it Yourself information fills the book. The Global Resources section informs you of worldwide organizations willing to pay part or all of your specific medical expenses. All you need to do is to apply for the assistance and to submit correct paperwork. Ready to rock your recovery and coping skills? Want to cope better with medical and/or mental health problems, including the expenses for your care? 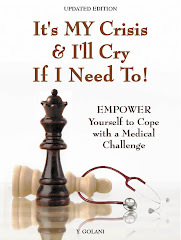 Buy the E-book or print edition of doctor-recommended EMPOWER Yourself to Cope with a Medical Challenge. Fill your mind with relaxing thoughts. The author is a survivor of a Petroclival Tentorial Meningioma, and impressing the medical world with her recovery! A Health Information Management professional (medical coder) with information about innovative medical and cost-cutting resources around the world, now she's helping readers all over the globe. How does she find her information? From cutting-edge colleagues, acquaintances and prodigious research. Are you Asian? European? Latino? Middle Eastern? Nigerian? North American? UKer? No matter where you live or how young/old you are, this book teaches you how to calm down plus how to minimize, even end, the confusion and chaos of illness. Read the Global Resources section to learn of cost-cutting organizations willing to pay part or all of your specific medical expenses. EMPOWER Yourself helps you to get your grin back despite illness or disability. Those worldwide organizations are willing to pay for part or all of an applicant's medical care, medication, medical appliances, and other medical needs. The coverage applies to medical, disability plus mental health care. Need air transport to a medical site? Covered. Latinos with liver disease? Covered. Can't afford necessary exams and hospital stays? Covered. Need a modest hospital gown so your buttocks aren't on display for everyone to see? Covered. Want a wheelchair you can't afford - at NO charge? Covered. Need affordable health insurance that meets your medical needs? Covered!!! The soothing text also helps you to build up courage and to calm down from the stress of illness. Medical and mental health professionals recommend EMPOWER Yourself to Cope with a Medical Challenge. Some of them sell it or display copies in their offices. Lower the emotional, physical and financial costs of your healthcare or disability issues. Find out how to get medical and mental health professionals to work with not against you when you read It's MY Crisis! And I'll Cry If I Need To: EMPOWER Yourself to Cope with a Medical Challenge! Buy the paperback or iPhone friendly Ebook. Learn how to communicate more effectively with medical professionals on pages 55 - 58. Make your needs clear to healthcare pros, family and friends – including annoying visitors! Pages 59 & 66-69 let you know what to do. Be sure to read the part entitled "Walk a Mile in My Shoes" aloud to them. Limited somehow by your medical situation? You'll be stronger – perhaps wealthier - after learning what to tell (and when) to potential employers in Chapter 12, "Employment with a Disability." Find out how to lower your costs in the Global Resources section at the back of the book. Buy It's MY Crisis! And I'll Cry If I Need To: EMPOWER Yourself to Cope with a Medical Challenge for yourself or someone you love. My name is Yocheved Golani. A former Health Information Management professional certified in Counseling Skills and Spiritual Chaplaincy, I'm repairing the "Patients are Clueless and Powerless" status quo of medical care. The Internet isn't enough for finding medical information to save or improve your life. You need facts, not rumors or false leads. It's MY Crisis! And I'll Cry If I Need To: EMPOWER Yourself to Cope with a Medical Challenge makes urgently needed information immediately available to you. Beautifully designed and simple to use, E-book or paperback It's MY Crisis! EMPOWERS you to reduce your stress and medical costs. Spiritual, inspirational, endorsed by medical & mental health professionals, It's MY Crisis! And I'll Cry If I Need To lets you laugh again with effective tips for surviving your critics & your situation. Save time & money with contact information for meeting medical needs with low-cost and free health care options at the back of the book. EMPOWER Yourself to Cope with a Medical Challenge today! Buy YOUR copy or a loved one's TODAY! Yocheved can EMPOWER You to Improve YOUR Emotional and/or Physical Health! Invite Yocheved to speak for your community, organization or tv/radio show: giveretgolani@gmail.com. It's My Crisis and I'll Cry if I Need To offers practical, powerful, and creative tools to empower anyone undergoing a medical crisis. Learn what to say to unpleasant people (relatives and medical staff included), and how to get them on your side! EMPOWER Yourself to Cope with a Medical Challenge. Find out how to lower your medical costs around the world in one reading (even how to join clinical trials). Please share your name and contact info when posting messages to me. "Anonymous" isn't an enlightening signature. Let's connect! Readers React to News Item about the Author! Read worldwide reactions to a news item about the author of EMPOWER Yourself to Cope with a Medical Crisis! A Well-Designed Easy-to-Read Format! And it's iPhone-friendly! E-book "It's MY Crisis! 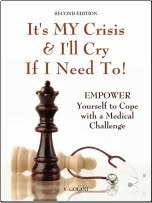 And I'll Cry If I Need To: EMPOWER Yourself to Cope with a Medical Challenge" gives you answers you need. I did the research so you can calm down in a hurry, then save major money on meeting your health needs. You need people to cooperate with you, to help with your healthcare. And you need to lower your costs. But friends & family complain that you're moody, short-tempered and forgetful. Take the kvetching, complaining and whining out of your medical life. Buy E-book or print edition "It's MY Crisis! And I'll Cry If I Need To: EMPOWER Yourself to Cope with a Medical Challenge." "It's MY Crisis! And I'll Cry If I Need To: EMPOWER Yourself to Cope with a Medical Challenge" teaches you what to say if people make fun of you for crying in fear or shame at your diagnosis, and what to do if people behave rudely to you in the hospital. The E-book or paperback hold lots of fun things to do for feeling better about yourself. Tips on how to organize your suitcase and self for going to the hospital and even for keeping your medical and insurance papers can keep you worry-free. SAVE MONEY! The back of the book tells you how to get free or low-cost First Quality Medical Care, Medication, Medical Appliances, Medical Transport and MORE. You just stop being worried after you read "It's MY Crisis! And I'll Cry If I Need To: EMPOWER Yourself to Cope with a Medical Challenge" because it lets you know what to do about so much of your medical life - and how to do it! EMPOWER Yourself to Cope with a Medical Challenge? Think. The alternative to coping - falling apart - is worse! Solve or prevent headaches for you or your loved ones. BUY the E-book or print edition "EMPOWER Yourself to Cope with a Medical Challenge" by clicking HERE! EMPOWER Yourself validates your need to cry over your medical crisis then EMPOWERS you to cope with it. Share what you learn with friends, loved ones, & your medical team. Make yourself happier by reading this book. The first edition was a hit! It's been #2 on the Musella site since Nov. 2 2008! The Updated Edition is going strong. Reviews of "It's MY Crisis! And I'll Cry if I Need To"
"I received EMPOWER Yourself to Cope with a Medical Challenge one week after I suffered my own medical crisis and found it very helpful. [It] will be of great benefit both in dealing with the fragile emotional health of sick patients and the stressful situation of the patient's caregiver… [with] very practical comprehensive information for dealing with a health-related crisis that is so seldom available to someone who is ill and preoccupied with their own troubles. "… this insightful and uplifting book guides us to confront illness in a multi-modal fashion... using all resources at our disposal—humor, creating a positive emotional environment, self-nurturing, friends, outside resources, medical and alternative practitioners—to fight illness. "Yocheved Golani gives excellent advice on how we can build and preserve good morale, get help when we need it, stay organized with appointments, medication, bills, etc., prepare for hospitalization, focus on our blessings and healing.… this book gives Resources... contact information about organizations and treatment centers that deal with specific medical problems... that most people wouldn't know how to find, including compassionate clowns, services for blind people, where to get free medical care and medications, and where to enroll in clinical trials. How My Books Can Help YOU! Hear My Nutritional Advisor Speak of My Shocking Recovery! BOOK ME TO SPEAK FOR YOUR ORGANIZATION! G-mail not working? Click HERE. DOES YOUR ORGANIZATION SERVE THE NEEDS OF ILL PEOPLE? Need a speaker? INVITE ME to speak about Coping with Illness techniques for a crowd. Get Your Grin Back with Giveret Golani Self-Help Coaching! Energize! Organize! Achieve your goals. A patient-empowering coach, I can help you to cope with the stresses of illness and more. Get your grin back with Giveret Golani Self-Help Coaching. I provide Self-Help Coaching services by phone or E-mail and face-to-face. Hire Me to help you to tame the bureaucratic chaos, rollercoaster emotions and other stresses associated with illness. COPING with EMOTIONAL and PHYSICAL STRESS. Conventional therapy focuses on the past. My Self-Help Coaching focuses on your present and more importantly, on your future! We'll work together to identify and to build on your existing strengths. You can use ensuing insights into achieving productive goals. Giveret Golani Self Help Coaching is based on using the TOOLS that work for an individual client. The GOALS of Giveret Golani Life Coaching are to assist you in making desired transitions in your personal lives, enabling you to increase your self-esteem and to make more and ever-greater accomplishments. We'll focus on your future and on getting better results than you've experienced in the past. Listen to how a recent client praised my work: "...I just wanted to let people know about a great resource I discovered. She does life / self-actualization coaching, among many other things. She's written several books, please take a look at the links below. She has very deep wisdom from life experience, and a great deal of practical sense. She specializes in coping with serious illness, but she works with all kinds of issues, as well. I had a great session with her today where she took a heap of ungrounded aspirations (eg., I want to write / get my ideas out into the world....somehow) and, in an hour and a half, turned them into a viable,workable action plan I could get started on and feel good about right away (a timeline and lots of practical sugestions to focus my energy on an attainable goal..."
You won't get lectures from me about what to do with your life. We'll explore that topic together! I'll listen to the goals you want to reach, ask lots of clarifying questions, then work with you to achieve your goals. You set the pace, I help you to keep going and to reach your destination. The information and ideas in my Self Help Coaching work, in this blog and in my book are not intended to replace personal advice from licensed physicians, and they do not constitute a doctor-patient or therapist-client relationship. Information in the above-mentioned resources is provided for informational purposes only. It is not a substitute for professional medical advice, nor a substitute for diagnosing or treating an emotional, mental, or medical condition. You need to consult board certified medical and mental health professionals in all matters relating to your health, and for suspected symptoms of illness requiring diagnosis or medical attention (including simple first aid). For spiritual matters, consult sensibly behaved clergy who demonstrate complete respect for your wellbeing. Your actions, based on information culled from my resource materials, are at your own responsibility and discretion. Yocheved Golani and Booklocker.com are not liable for any direct or indirect claim, loss or damage resulting from use of my book or blog and/or any media materials including web site(s) and blogs linked to/from it. Readers RAVE About "It's MY Crisis!" Rich in resources. Cutting-edge information. Check out this GLOWING REVIEW by a world-famous psychologist! Share the book with friends and loved ones, medical and mental health professionals, or read it alone. Start relaxing with the very first page. It’s MY Crisis! can solve or prevent MANY problems for you or your loved ones. Solve, Even Prevent a Medical Crisis! Benefit from the positive impact of the book’s humor, insight, can-do exercises and cost-cutting medical information. The FIRST EDITION of It's MY Crisis! And I’ll Cry if I Need To truly is "A Life Book that Helps You to Dry Your Tears and to Cope with a Medical Challenge." Get it from Barnes & Noble ! Free shipping on orders of $25 or more. Buy copies for family and friends! Order DIRECTLY from the PUBLISHER, Booklocker, for faster delivery. For $13.95 plus shipping, you can ease your mind and cope better with a medical crisis! Save money on bulk orders! E-mail angela - at - booklocker.com or CLICK HERE! Want cases of FIRST EDITION of "It's MY Crisis"? Fax requests to USA # (207) 262-5544. EMPOWER YOURSELF with the Updated 2nd Edition of "It's MY Crisis! And I'll Cry if I Need To"
Click on the Cover to BUY Your Copy TODAY! Click the photo. Learn about the cover art. MY PUBLISHER SELLS IT FOR FAR LESS THAN E-BAY!